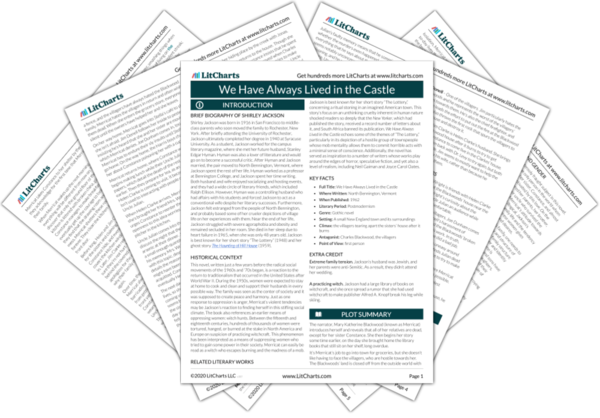 Instant downloads of all 946 LitChart PDFs (including We Have Always Lived in the Castle). Welcome to the LitCharts study guide on Shirley Jackson's We Have Always Lived in the Castle. Created by the original team behind SparkNotes, LitCharts are the world's best literature guides. A concise biography of Shirley Jackson plus historical and literary context for We Have Always Lived in the Castle. A quick-reference summary: We Have Always Lived in the Castle on a single page. In-depth summary and analysis of every Chapter of We Have Always Lived in the Castle. Visual theme-tracking, too. Explanations, analysis, and visualizations of We Have Always Lived in the Castle's themes. 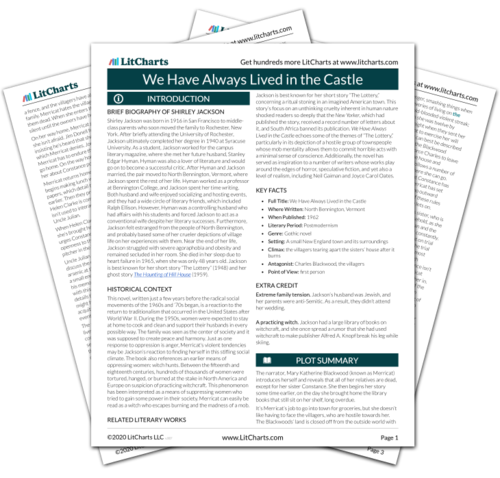 We Have Always Lived in the Castle's important quotes, sortable by theme, character, or Chapter. Description, analysis, and timelines for We Have Always Lived in the Castle's characters. Explanations of We Have Always Lived in the Castle's symbols, and tracking of where they appear. An interactive data visualization of We Have Always Lived in the Castle's plot and themes. Shirley Jackson was born in 1916 in San Francisco to middle-class parents who soon moved the family to Rochester, New York. After briefly attending the University of Rochester, Jackson ultimately completed her degree in 1940 at Syracuse University. As a student, Jackson worked for the campus literary magazine, where she met her future husband, Stanley Edgar Hyman. Hyman was also a lover of literature and would go on to become a successful critic. After Hyman and Jackson married, the pair moved to North Bennington, Vermont, where Jackson spent the rest of her life. Hyman worked as a professor at Bennington College, and Jackson spent her time writing. Both husband and wife enjoyed socializing and hosting events, and they had a wide circle of literary friends, which included Ralph Ellison. However, Hyman was a controlling husband who had affairs with his students and forced Jackson to act as a conventional wife despite her literary successes. Furthermore, Jackson felt estranged from the people of North Bennington, and probably based some of her crueler depictions of village life on her experiences with them. Near the end of her life, Jackson struggled with severe agoraphobia and obesity and remained secluded in her room. She died in her sleep due to heart failure in 1965, when she was only 48 years old. Jackson is best known for her short story “The Lottery” (1948) and her ghost story The Haunting of Hill House (1959). This novel, written just a few years before the radical social movements of the 1960s and ’70s began, is a reaction to the return to traditionalism that occurred in the United States after World War II. During the 1950s, women were expected to stay at home to cook and clean and support their husbands in every possible way. The family was seen as the center of society and it was supposed to create peace and harmony. Just as one response to oppression is anger, Merricat’s violent tendencies may be Jackson’s reaction to finding herself in this stifling social climate. The book also references an earlier means of oppressing women: witch hunts. Between the fifteenth and eighteenth centuries, hundreds of thousands of women were tortured, hanged, or burned at the stake in North America and Europe on suspicion of practicing witchcraft. This phenomenon has been interpreted as a means of suppressing women who tried to gain some power in their society. Merricat can easily be read as a witch who escapes burning and the madness of a mob. Jackson is best known for her short story “The Lottery,” concerning a ritual stoning in an imagined American town. This story’s focus on an unthinking cruelty inherent in human nature shocked readers so deeply that the New Yorker, which had published the story, received a record number of letters about it, and South Africa banned its publication. We Have Always Lived in the Castle echoes some of the themes of “The Lottery,” particularly in its depiction of a hostile group of townspeople whose mob mentality allows them to commit horrible acts with a minimal sense of conscience. Additionally, the novel has served as inspiration to a number of writers whose works play around the edges of horror, speculative fiction, and yet also a level of realism, including Neil Gaiman and Joyce Carol Oates. Extreme family tension. Jackson’s husband was Jewish, and her parents were anti-Semitic. As a result, they didn’t attend her wedding. A practicing witch. Jackson had a large library of books on witchcraft, and she once spread a rumor that she had used witchcraft to make publisher Alfred A. Knopf break his leg while skiing. Greider, Julia. "We Have Always Lived in the Castle." LitCharts. LitCharts LLC, 22 May 2017. Web. 24 Apr 2019. Greider, Julia. "We Have Always Lived in the Castle." LitCharts LLC, May 22, 2017. Retrieved April 24, 2019. https://www.litcharts.com/lit/we-have-always-lived-in-the-castle.